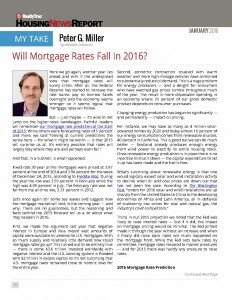 Will Mortgage Rates Fall in 2016? Not necessarily says Peter Miller in his thoughtful piece included below. Assuming conflicts in the Middle East remain contained, oil prices stay low and interest in Europe and Asia remains low, there will continue to be an influx of dollars to the US. The result could be marginal for borrowers in the year ahead. The world economy will most certainly impact Hancock Park and Windows Square real estate one way or another depending on whether you are a seller or a buyer. Stay tuned. We’ll help keep you posted.